Attention: Senior Managers and Executives. How to Amplify Your Performance in 2016. 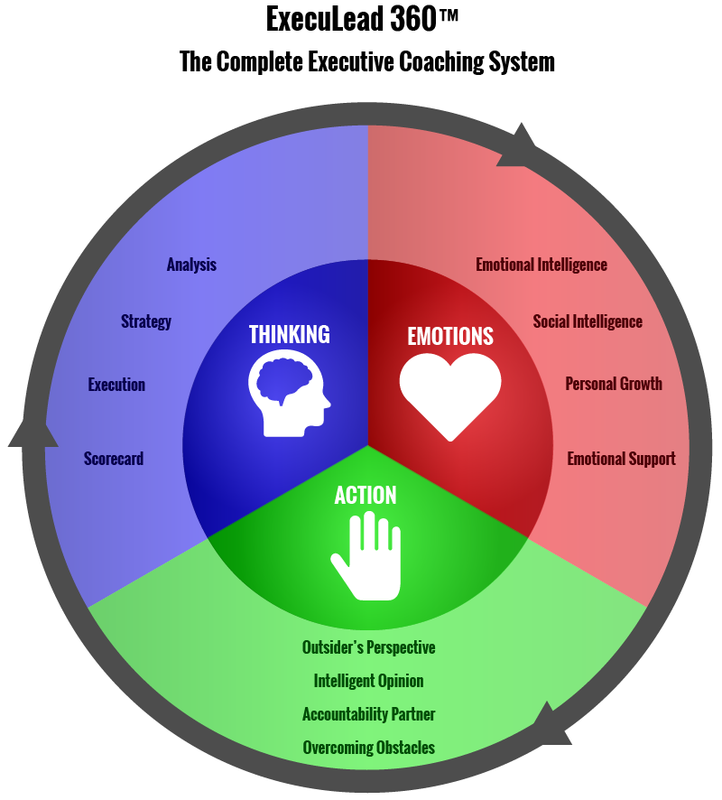 Why Do You Need Executive Coaching? Offers useful suggestions, and outside perspectives. It is very difficult to go it alone. Because you are alone. Many execs are surrounded by people, but still feel lonely. As the people around them are either staff or bosses. They need someone outside the organisation to talk to. ExecuLead 360™ coaching is a holistic coaching program specifically developed for the needs of senior managers and executives. It provides you with the support you need to dramatically enhance your performance. ExecuLead 360™ covers the three core dimensions of peak performance. Firstly, we begin with the Red, your emotions. Scientific studies have found that there is a direct correlation between emotional mastery and executive performance. Leaders with high EQ, simply do better, climb faster and have higher performing teams. Secondly, we focus on the Blue, your thinking. Achieving world-class results requires a strategic approach, with effective success systems. We provide you with those systems and teach you how to use them. This process incorporates many of the practices taught in top MBA programs, such as Harvard, but we take it much much further. Thirdly we focus on the Green, you taking action. You cannot achieve results without effective action. We help you to take effective action. This includes acting as a sounding board for your ideas, helping you to overcome the obstacles that emerge during execution, and acting as an accountability partner to keep you focused on what matters most. When you combine Blue, Red and Green, you get the colour White. That is the final colour we focus on. The synergistic mastery of thought, emotions, and action. When you synergise these three elements your performance is dramatically and permanently amplified. We're Dedicated to Unleashing Your Full Potential. Dawning Truth has been helping people and organisations excel since 2001 (Over 14 years). We have worked with organisations of all sizes from large multi-nationals to smaller family owned businesses. Some of our customers include Deloitte, Accenture, Pilot CrushTec and Madison Life. We have trained over 2000 people and provided executive coaching on the highest levels in the organisation. Once You Try Us, You'll Want to Stay with Us. You Want to Amplify Your Performance in 2016, Don't You? This Is Your Opportunity Seize It Now. Contact Us Now to Schedule Your Free Coaching Session. © 2019 by Dawning Truth.